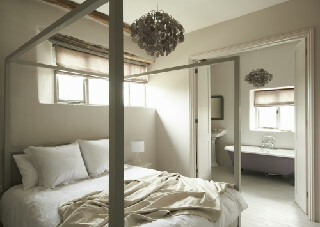 Holiday cottages sleeping up to 4 people. Four 'boutique-rustic' cottages, lovingly and newly renovated by the interior designer-owner, combine the sophistication of boutique hotels with the laid back vibe of country living. 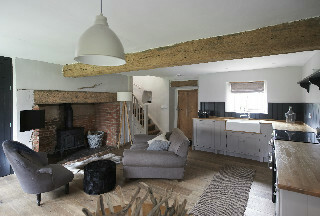 Cartshed Cottages are both stylish and comfortable. A mix of vintage and contemporary furniture, oak floors, natural materials and Farrow & Ball colour palette create a relaxed mood befitting the local North Norfolk environment. All have new plumbing, central heating, quality beds, mattresses and 200 thread count linens. All offer Freeview TV, iPod/iPhone docks and wifi. Towels and linens provided. All are non-smoking. There is shared access to washing machine, ironing facilities & extra fridge/freezer space. Shell is one of our most spacious cottages,with two ensuite double bedrooms - one 4-poster king with cast iron roll top bath, one a super-king/twin with walk-in shower. 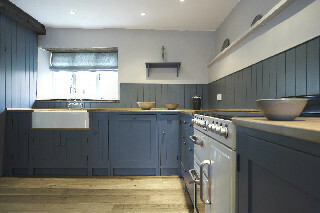 The large kitchen has a hand-built painted kitchen with open access to a sitting room with rustic fireplace, log burning stove and seating for four. Sky, our other larger cottage has one king bedroom with walk-in shower, oversized console basin & separate WC, one super-king/twin with open plan bathroom, cast iron roll top bath, oversized console basin. Downstairs is a hand-built kitchen and large sitting room and open fireplace with log burner. Seal is our most romantic cottage, for 2. It features a 4-poster king-size bed with cast iron roll top bath-in-bedroom, ensuite pebbled walk-in shower and oversized console basin. Downstairs is an open plan kitchen/dining/sitting area with hand-built painted kitchen and large fireplace with log burner. Samphire is our smallest two-bed, with one double bedroom and one super-king/twin. The shared bathroom has a cast iron roll top bath & separate pebble-tiled shower. 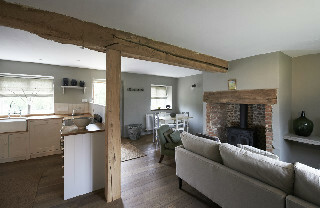 There is an open plan hand-built kitchen/dining/sitting area & large fireplace with log burner. The best that North Norfolk has to offer is all within easy reach, from coastal walking to antique hunting to gastro eateries. Holt (2m) & Burnham Market (16m) for antiques and shopping, Blakeney & Cley (4m), Salthouse & Morston (5m), Wells (10m) for seaside villages, salt marshes, beach huts and walks. Holkham Hall & Beach (11 m), Felbrigg, Sheringham, Blickling & Houghton Halls (7-13m) for stately homes and stunning scenery, Pensthorpe (8m) & Cley marshes (5m) for wonderful wildlife. The area is becoming increasingly renowned for its pubs and local food. Whether heading out for an atmospheric meal or cooking in, Sharrington Hall is ideally located for satisfying any appetite. The famous Sharrington Strawberries is a two minute stroll away (in season! ); the excellent deli/cafe/restaurant Back to the Garden is less than a mile down the road; Holt has fine local butchers, fishmongers and grocers; and veg/egg stalls outside plenty of front doors for that home-grown feel. All the local gastro pubs and eateries are an easy drive away: pubs, farm cafes, oyster caravans, seafood shacks, fish'n'chips, village cafes, smokehouses, coffee vans and a Michelin star. You can even get a flat white if you know where to go. We take bookings for 3-night weekends (Fri-Mon), 4-night mid-weeks (Mon-Fri), full weeks, or variations thereof. Weekends and midweeks are �395-�525. In the peak summer period, ie July 19 - Aug 30, the two-bed cottages are only available for full weeks (Fri-Fri) but Seal is available for weekends and mid-weeks throughout. At Christmas ie Dec 20 - Jan 3, all cottages are week only.